In 2018, RPM Rental Direction is proud to announce that we have added two electric Volts to our fleet! Just another step in our effort to Going Green! That’s a great decision Olivia. How did your team come to choose the Chevy volts? I wrote a post on electric vehicles http://gordcollins.com/auto-insurance/buy-electric-car/ and it’s interesting to see people and businesse take a gamble and go electric. Maybe your team couldn’t wait for the new Electric Porsches? Please write a post later about they’re faring. We choose the Volts due to price and their ability to run on gas as well. 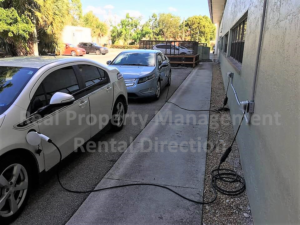 Our property managers can spend the whole day driving from property to property and there is not always a option to plug the car in between trips. We do also have a Toyota Prius in our fleet as well but we liked the Volts due to the innovation. I’d ideally love to get our entire fleet on 100% electric one day; But they would have to be able to do 100’s of miles on a single charge. My drivers with the Volt had an issue charging it when Hurricane Irma hit us and left people without power for weeks. In that case the Hybrids make it a better decision. They need to push ahead on the recharging stations. I hear the Teslas range is improving immensely. Here’s hoping you don’t have anymore Hurricanes! Yes; I am very happy with my Hybrid. Teslas are very nice cars but they are on the higher end of the budget. Let’s hope no more hurricanes; or at least major ones!